The oak tree is a vital part of the UK’s cultural and national landscape and is one of the most common and loved broadleaf trees. Our oak trees are a foundation species that define much of the structure of our native ecosystems, enrich our lives and support thousands of other native species, yet they are now facing a fight for survival. Environmental pressures such as climate change, pollution and drought, coupled with pests and diseases, mean our oak trees need our collective intervention to prevent their future loss – now you, as a photographer, can help. 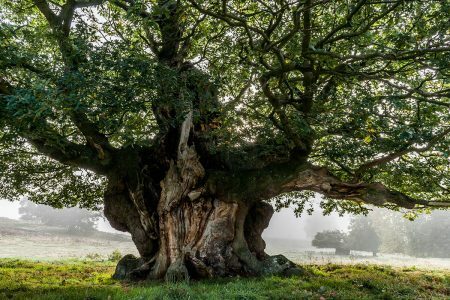 This special award will celebrate the UK’s oak through photography, raise awareness of the Action Oak initiative, and raise money for essential scientific research and monitoring. All net entry proceeds from this special award will go direct to Action Oak. Action Oak is a unique collaboration of partners including charities, governments, landowners and research institutions, dedicated to protecting oak trees for future generations. Over the last five years Action Oak partners have invested over £10m in research on pests and diseases, such as Acute Oak Decline, and managing the oak processionary moth outbreak in the London area. The partnership is committed to raising further funds for vital research and monitoring to protect our oak trees. The founding partners of Action Oak include the Royal Botanic Gardens Kew, Woodland Heritage, the Woodland Trust, the Forestry Commission, the National Trust, Forest Research, the Duchy of Cornwall, the Department for Environment, Food & Rural Affairs and the governments of Scotland, Wales and Northern Ireland. In total there are more ancient oak trees in the UK than in all other EU countries combined. In London alone, oak is estimated to be the most valuable tree species, with an estimated replacement cost of almost £1 billion. Oak trees sequester more carbon than any other species; enhance landscapes; support wildlife; provide playgrounds for children; and offer shade and relaxation for city dwellers and workers. Parts of the west coast are also home to the internationally recognised Atlantic Oakwoods, known as our ‘temperate rainforest’, providing habitat to distinctive plant and animal communities. Oaks are iconic trees and make superb subjects for garden photography, nature photography and landscape photography alike. International Garden Photographer of the Year has seen many winning pictures of the UK’s oaks, from sapling to venerable specimen. Only last year did Michael Hudson’s image ‘Ancient Oak’ win the Black & White Photo Project. Your entry will not just showcase the importance of a thriving, green planet, you will directly help to conserve UK oak trees and all the species that depend on them. All net entry proceeds will be delivered back to Action Oak to fund critical research. Winning images will also form part of a special book publication, with all proceeds going directly to this important project. A tour of either Westonbirt or Bedgebury, when closed, with a drink and nibbles plus a prize wooden writing implement. A tree dedication from the Woodland Trust. Choose from woods all over the UK and you will receive a special pack containing a certificate with your dedication message and information about the woodland. In addition to the normal IGPOTY annual publication of winners, by entering Celebrating Our Oaks, you agree that your image or images, if successful, may be chosen for publication in a special book of this award and wider Action Oak initiative. This book will be delivered by IGPOTY on behalf of Action Oak as a special project. Photographers are protected by normal IGPOTY guidelines of copyright and will retain copyright of their images. All proceeds of the book will be kept by Action Oak. By entering you agree to support this charitable publication. All other fundraising activities in relation to winning images will seek specific permission from involved photographers. There will also be an exhibition of selected winners during National Tree Week (24th November – 2nd December 2018). Location TBC.